#1: Do You Provide Quotes or Proposals? Food for an event can easily eat up 50% of an entire event's budget. Ask for a proposal when comparing multiple caterers, or for an average price range for events of your size, to properly plan for this cost. Of course, you always want this answer to be “yes.” This means the company has met health department standards and has liability insurance. Also make sure this includes a liquor license if you're having a bar. #3: Do You Have a Contract? A contract is designed to define expectations and hold both parties accountable. This ensures both parties understand the terms of the event and can deliver accordingly. So, make sure you thoroughly understand your caterer's payment schedule and cancellation terms and detail all agreements made verbally so as to avoid any unexpected surprises. Tip: Take time to double-check the date, time, and guaranteed number of attendees listed in the contract. Then, make sure your add/delete date for guests on the contract corresponds properly with the RSVP date. This will help avoid any added costs associated with making post-deadline changes to your contract. #4: Do You Have Any Specialties? Your potential caterers should provide a sample menu and their list of specialties. If your event includes guests that require a specialized menu, ask if your caterer is able to prepare vegetarian, kosher, kids, or halal meals. Also consider that some caterers specialize in larger events, while others specialize in smaller events; choosing one that fits your needs will make your event run smoothly, while being cost-effective. #5: Can We Schedule a Tasting? Caterers are typically willing to offer food tastings, which help potential clients’ decide to hire them or not. This can not only help you narrow your caterer options, but also give you an idea of what you want on your menu. #6: Who is My Main Contact, and Will that Person Be Attending My Event? You will want to identify one main contact with your caterer that you can contact throughout the entire catering process. Being in close contact with them will help keep communication consistent and ensure your event is customized to your specifications. Having your contact attend your event is important, too, because it makes sure someone is onsite to ensure everything runs smoothly. #7: What Do You Provide? Does the caterer provide tables, chairs, plates, table linens, silverware, salt-and-pepper shakers, place cards, favors, and more? Ask to see these items to make sure they are acceptable for your event. If not, you may need to rent your own equipment. #8: Do You Provide Your Own Staff? What is the staff responsible for? Do they handle table settings? Will they set out place cards and favors? Caterers will often insist on using their own serving personnel because they understand the caterer's policies and procedures. #9: How Do You Handle Cleanup? 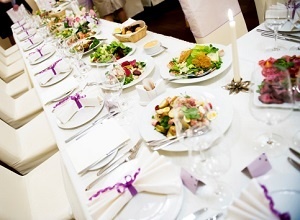 Most caterers include cleanup, but make sure your contract specifically addresses post-event cleanup. You don't want to be unexpectedly stuck cleaning up after your event. #10: Do You Serve Alcohol? If you are interested in providing a bar, check with your caterer to see if they offer this service, and if they are licensed (as mentioned above). If yes, does the catering company provide a bartender, or is that handled separately? If they do provide a bartender, ask what guests can expect to be served; does the bartender know how to mix an extensive variety of drinks or will they simply be pouring wine and beer? If you want to offer your guests a specific selection of alcohol, review these details with your caterer.